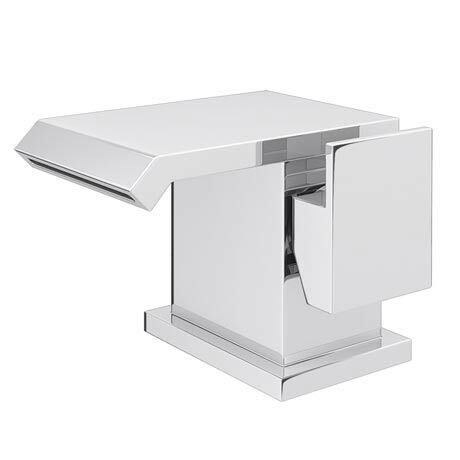 A very stylish mono basin mixer with a modern striking design, the glacier tap is characterised by it's cool minimalist square body with matching side action lever handle and modern angular waterfall effect spout, which provides a beautiful stream of water. Manufactured from solid brass with a quality chrome finish. It's contemporary design will bring a touch of sophistication to your bathroom. Supplied with a slotted brass click clack waste. Q. will this tap work on a low pressure system (gravity fed)? Hi Andy, this product has a Working Pressure of - 0.5 Bar - 6 Bar. Thanks! "Great looking tap, a real eye catcher, designer looks at a reasonable price." Nice and heavy and look's fab.Appears to be well made. This tap looks really lovely and looks very expensive indeed. I am more than happy. I bought this tap in the sale and have seen this tap more expensive on other sites. Tap is substancial & well made. The problem is that water gets under the tap base & drips down through the fitting hole.solved by filling base of tap with silicon. .
Great looking tap, cant comment on how it works as not fitted yet, but looks and feels very good quality, coming with a free Click Clack Waste makes this purchase even better. Ordering and delivery were very easy and fast, first class and would highly recommend Victorian plumbing. Very modern waterfall tap. Good solid quality. Really improves the Bathroom. If you are looking for a tap that will look stunning. This is the one. Title says it all really. Service and delivery were excellent also. Having searched for something a little different for my new cloakroom sink and this really caught my eye. Always a little apprehensive when buying something which is much cheaper than other sites/shops. Very pleased then when the tap turned out to be of high quality and very well packaged. Came with pipes and pop-up waste so all in all fantastic value for money. Highly recommend both the product and the company who delivered as promised.